Every once in a great while, I find a book that is a balm for the soul. Simple and elegant, it shows me the wider world without forced drama. It is subtle. Powerful, but in the way a good soak in a hot bathtub is – soothing, strong, and rejuvenating. I hardly ever find stories like it, that just leave me at peace. Habibi completely took me by surprise. My mother recommended it after she visited Israel in the fall, when I was asking how her impressions of the Middle East aligned with her preconceived notions, but I had forgotten about it. Now my in-laws are getting ready for their own trip to Israel next month, and the very strangeness that they would all be traveling there within a few months of each other, when none had ever been before, made me curious again. 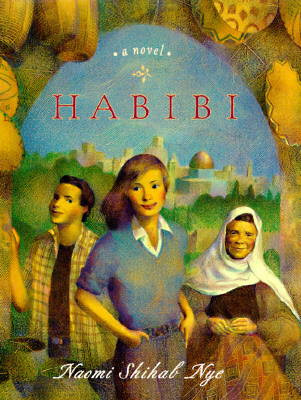 Having read Habibi, I could see how the heart might really want it. I loved Nye’s descriptions of the villages and cities, of the Dead Sea and the Bedouins, of the culture of precarious balance. This novel has a real gentleness to it that isn’t often used when approaching the topic of conflict in Israel. Liyana and her family move from St Louis to her father’s hometown between Jerusalem and Ramallah just as she’s about to begin high school. The frustration in this culture shift is not over-played, and yet Liyana’s loneliness is tangible. The pace of the story – of a girl adjusting to a more conservative culture, to a new language, to a world far from the neighborhood where she was born, where even the corner grocer knew her by name – is lilting; it almost reads like a diary in verse. As she begins to find her place in this new life, I couldn’t help but be sucked into her big, talkative, cheek-kissing family, the tentative friendships she builds with people outside of her Palestinian heritage, the new foods that she lovingly describes. I know I’ll still be nervous when our family travels there in a few weeks, but a part of me will also be longing to walk those same streets and see that part of world in a new, richer light. Naomi Shihab Nye doesn’t appear to have a personal webpage, but plenty of interviews, quotes, letters and poems can be found on the internet.